Another important message is that installations done before Smart Office 10.2.1 HF18 must uninstall existing earlier version of Process Server component before applying HF 18 or later. Read more in the Installation Guide section – Configuring Infor Process Automation or ProcessFlow for use with Infor Smart Office. That means that if you have Process Server feature installed in a pre-HF18 version of Smart Office, version 10.2.1.0.169 or previous versions, then you must uninstall the Process Server application in LCM and install it again. The reason is that the features included have changed. As of HF18 you should only have one Process Server related feature called Infor.PF in the Manage Installation Point tool. Make sure you uninstall en re-install and that you don’t have these old features in the Installation Point Manager. 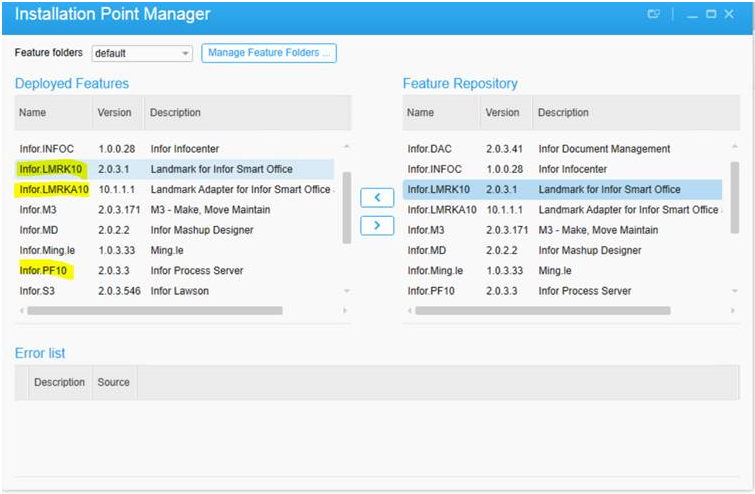 There is also an Manage Application view within the Grid Management pages for MangoServer administration where you can see which applications, features and mashups are installed by accessing the Grid Management UI on the server where the server component for Smart Office (MangoServer) is installed. But as of HF18 there should only be one new Infor.PF feature and the previous should not be used. There is no need to reconfigure anything but you must uninstall the previous version and install the new version. You get the new .lawsonapp from the hotfix that is downloaded in LCM. In my next post I’ll show you how. This entry was posted in Smart Office Administration on December 29, 2016 by Karin Portillo.